For a more conventional fireplace, choose the traditional model with its realistic hand-painted log set and ceiling-mounted accent lighting. Add the Cottage Angled Brick or Traditional Stone liner – or the Black Porcelain liner which reflects the flame to create even greater visual interest. The available andirons help convey an old-world look. 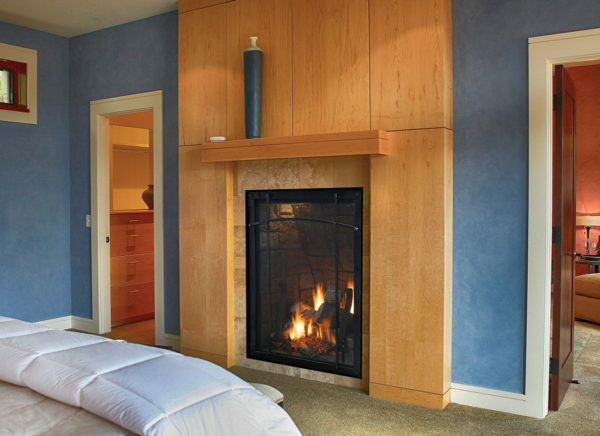 All Canvas fireplaces include a multifunction thermostat remote control that can vary the flame height of the main burner. The remote lets you vary the accent lighting system or the optional blower, and even operate an unrelated appliance – such as a lamp or holiday decorations plugged into the outlet beneath the fireplace. The clean-face design allows tile or stonework to the edge of the window frame.